It's the 1st of the Month and that means it is the start of the Bella Skill Builder hosted by the Fat Quarter Shop and Sherri McConnell!!!! Today I am super excited to share the first set of skill building blocks and this month it is all about Kaleidoscope Blocks!!! My plan is to make tone on tone blocks each month in an assortment of rainbow colors. It is going to be so pretty when it is all done ;) For the large version of the block I used Bella Solid Royal and Amelia Blue. And for the smaller version of the block I used Bella Solid Iris and Prune. And I just loved seeing all of those happy little points match up on the small version. So fun!!! And of course, this is my favorite because it is purple :) And I only made 1 as I am planning on a slightly different layout, we will see how it all comes together throughout the year. 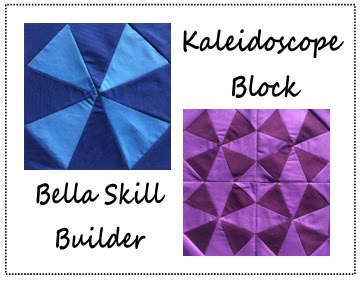 And that is the Kaleidoscope block, the first set of blocks in the Bella Skill Builder!!!! I will continue to share a new set of blocks on the 1st of each month. You can find all of the details on this fun Skill Builder as well as this month's patterns over at Fat Quarter Shop's blog, Jolly Jabber ;) So what do you say, wan't to come learn some skills on the Bella Skill Builder with me??? It is going to be so much fun!!!! Neat blocks Melissa and fun colors! Bright and bold colors - loving your blocks! My palette is more muted this time. I think building my skills once a month sounds like a good plan. I will join in the fun. Love your fabric combo.Your quilt will be stunning!